The SAH electric pumps are ideal for when you want to make snow without the noise. 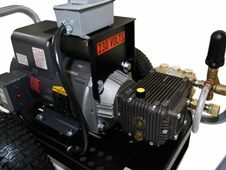 A 220 volt outlet is required to operate our high volume pumps, but 35' of cord and up to 200' of high pressure extension hose can be used to get the snowmaker to the location you want. For night time snowmaking our 220volt pumps can't be beat. For the very best in remote and portable snowmaking applications check out our SAH 6.0 and 7.5 Gas snowmaking pumps. 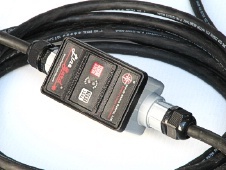 To make our snowmaking pumps work for you year round, you will want to consider adding the Pressure Washer Accessory Kit that has been custom matched to the flow and pressure associated with this pump. Tell your spouse that next summer you promise to clean the driveway, gutters, car, truck, deck, fence, the mold from the side of the house, and anything else she wants. When you pull the trigger on the lance hooked up to one of our large pumps for the first time we guaranty a smile, it’s impossible not to. You won’t mind taking on any cleaning job with these machines knowing you won’t have to pull out that little pressure washer you bought that looks more like a small vacuum cleaner. 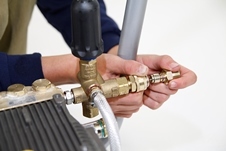 Once you clean with one of our high flow pumps, you will never use anything else.